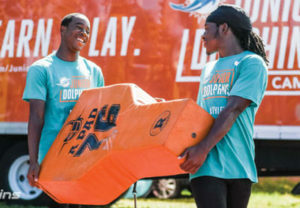 included Junior Dolphins branded shirts, Gatorade coolers, blocking shields, medicine balls, ropes and cleats. The team also had the opportunity to hear from Dolphins alum and Youth Programs Ambassador Twan Russell about the importance of teamwork and gratitude. This is the third Junior Dolphins Equipment Donation this year. 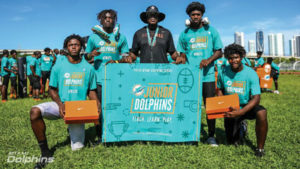 The Dolphins also donated to Miramar High School in May and Pompano Beach High School in July.